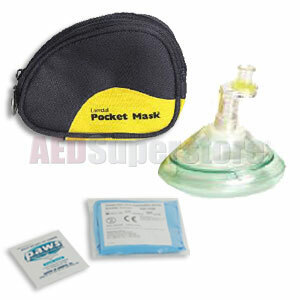 Pocket Mask w/Oxyegn Inlet and Head Strap w/Gloves and Wipe in Black Soft Pack by Laerdal Medical. Contains disposable one-way filter valve. This mask is used for adults, children, and infants. Instructions included. Connection port 15mm O.D. Not made with natural rubber latex.